Art With Me *GNP “Presented by TANE” emerged in 2018 as Tulum’s first Arts & Ecoculture Festival. With the second edition taking place from April 24-28, we are excited to announce the second phase of international artists and musical acts. Art With Me *GNP is a community-driven festival offering programming across seven core pillars encompassing art, sustainability, music, wellness, culinary, and family as a platform to inspire change. Our theme for 2019 is Change Starts With Me, and a key focus of the festival is bringing awareness and solutions to the infrastructure and environmental challenges that Tulum faces with the mission of building a more sustainable future. Highlights from the phase two art lineup include the renowned project Cosmogolem by Koen Vanmechelen, a monumental wooden statue focused on bringing relief to children in need. The piece has already been in over 30 countries and gives children the chance to be creative and share their dreams, hopes, and desires. Art With Me *GNP will be the setting for one of Koen’s dialogues on Human Rights, which will also be presented at the Human Rights Pavilion at the Venice Biennale of Art in partnership with Ai Weiwei. IK Lab Tulum will be presenting the exhibition Alchemistry, featuring Los Angeles based creator of experimental sculptures and installations Kelly Akashi, multidisciplinary artist known for blending various materials Bianca Bondi, and NYC based artist bringing mythological components to the project Rochelle Goldberg. IK Lab Uh May will present the project Conjunctions featuring Brazilian large-scale installation artist Ernesto Neto, political Afro-Brazilian artist Paulo Nazareth, Russian sustainability artist Oskar Metsavaht, and IK Lab veteran Margo Trushina. Other highlights include Aguae by Michael Benisty, who work has been displayed at Burning Man and beyond. This piece will tie into our focus on sustainability and environmental protection. We are also thrilled to announce Dream With Me presented by Constellation and featuring the revered Spanish artist Okudart. This will allow participants to reflect and share their dreams for a better world and will include a live concert, sound healing, and a collective dream ceremony. The Mexico City art gallery MAIA Contemporary is represented in the phase two art lineup by Simon Vega, who creates art inspired by self-made architecture and vendor carts found in the streets and marginal zones of Central America using wood, cardboard, plastic and more. We will present a focus on the indigenous creative scene with Tulum Art Club, which will include Anton Kojtom, Porfirio Gutierrez, Beatriz Poot and more sharing their unique stories through art. New additions to the Dance With Me lineup include the Canadian electronic duo Bob Moses, mysterious Berlin-based producer and performer David August, fellow Berlin-based artist and All Day I Dream favorite YokoO performing an extended 5-hour set as part of his “Nothing Can Compare Album World Tour,” global electronic project Concret, and more performances from live artists and DJs. Phase two will also feature a talented group of female DJs that includes Los Angeles house DJ Duchess, Palestinian house artist and current Mexico City resident Nour, and Madrid native known for her deep sound Russ Farelo. The lineup is rounded out by Mayan Warrior favorite Dramian, electronic verteran currently based in Los Angeles Isaisah Martin, Chicago house and techno musician Halo Varga, New York City DJ and producer Caines, and Los Angeles underground act Brandon Ernst. These new additions add to a diverse lineup that includes music from acclaimed vocalist, filmmaker, and humanitarian Michael Franti, globetrotting Brooklyn house duo Bedouin, a live band performance from Berlin-based techno artist Jan Blomqvist (Live), and German songwriter and producer known for his ambient approach to performing electronic music Monolink (Live), along with art from Mexican surrealist artist and designer Pedro Friedeberg, American painter dubbed “the godfather of pop surrealism” Mark Ryden, multidisciplinary artist known globally for his larger-than-life sculptures Daniel Popper, and much more as noted here. Other programs within the Art With Me *GNP experience include the festival’s environmental pillar Care With Me, the culinary-focused Eat With Me program curated by Chef and Owner of Tulum based restaurant ARCA, José Luis Hinostroza, the Breathe With Me wellness program that includes everything from women’s circles to plant medicine healing, the Play With Me pillar focused on creating a family-friendly experience, and finally Give With Me, which will include free concerts, educational talks, and art designed to spread awareness about our mission in the local Tulum community. More information can be found on our website, and tickets to attend the festival can be found here. Early bird tickets have already sold out and Tier One tickets are moving quickly. Art With Me *GNP understands the impact of large crowds on the infrastructure and delicate ecology of Tulum and is limiting ticket sales to create an intimate experience for festival goers. Art With Me is a community-driven festival that curates art, talks, music, wellness and cultural experiences as a platform to inspire change and foster awareness amongst attendees. The festival debuted in 2018 as Tulum’s first Arts & Cultural Festival and will be returning in 2019 from April 24-28. 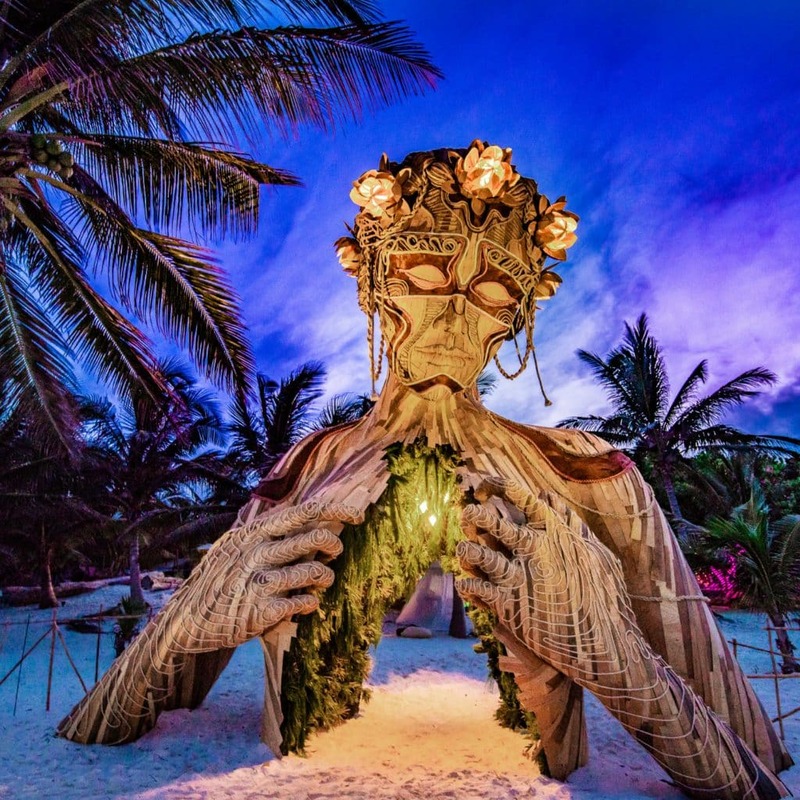 The festival was co-founded by Ahau Collection founder David Graziano and Tulum resident Jorge Mondragon with the goal of uniting businesses, tourists and the local community to spearhead environmental and cultural initiatives for the benefit of Tulum.